Most corporate partnerships involve a company working with a single charity, but last year the furniture store Ikea decided to partner with no fewer than six charities for its new campaign, which focuses on play. The company chose to work with Unicef, Save the Children, War Child, Handicap International, Room to Read and Special Olympics on Let's Play, a three-year initiative begun to increase awareness of children's right to play, no matter where they are in the world. The Ikea Foundation, the company's associated charitable trust, selected the partners after inviting proposals from charities and aid organisations. The campaign raised funds by donating EUR1 (88p) for every children's book and toy sold in an Ikea store worldwide between 20 November and 24 December 2016. More than 12 million children's products were sold during the period and Ikea has donated a total of £19m to the six partner organisations so far. Chris Williams, communications manager at the Ikea Foundation, says the donations included "extra contributions" from Ikea to give the projects the best chance of success in 2017. Williams says the campaign was actively promoted in its UK stores. "We helped to bring the campaign to life by installing pop-up galleries in our Stratford, Glasgow and Leeds stores," he says. "These featured photography from our six charity partners depicting children playing in challenging conditions, and further highlighted the importance of the children's right to play. These galleries were showcased on our website, where customers could find further information about the campaign." The campaign also used virtual reality technology in some stores to help show its charity partners' work in an interactive way. The fundraising initiative will be repeated over the Christmas periods in 2017 and 2018. The money raised will be used to fund projects in countries including Bangladesh, China, Ethiopia, India, Pakistan and Thailand. 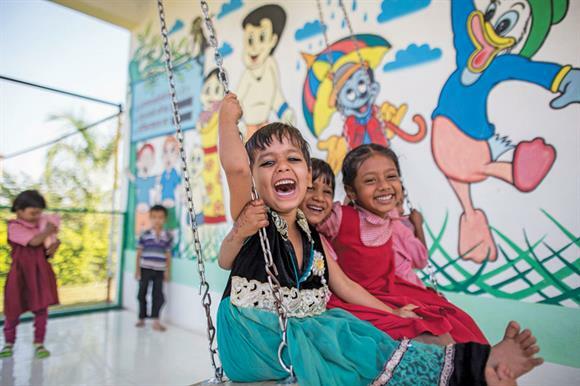 Handicap International will use the donation it receives to provide play and childhood development opportunities for children with disabilities in refugee and internal displacement camps in Bangladesh, Pakistan and Thailand. Williams says: "We have been delighted by customers' response to the Let's Play campaign and are thrilled by the amount they helped us raise during the 2016 campaign."